The images splashed across television screens and newspapers after deadly tornadoes ripped across the Southeast in April can’t begin to depict the devastation and grief as survivors begin to grapple with their losses. It’s a scene that many Floridians have experienced for themselves in the wake of hurricanes and other natural disasters. If a storm is forecast for your area, there are procedures to have in place to steer local churches when things appear to be spinning out of control. The Disaster Recovery Ministry of the Florida Annual Conference, which was formed after Hurricane Charley hit the state in 2004, has set those procedures in place. With hurricane season looming on June 1, Disaster Recovery Ministry held a training session April 30 at Beymer Memorial United Methodist Church in Winter Haven, designed to familiarize people with the ministry as well as to get people thinking about the importance of having a current disaster plan in place before catastrophe strikes. Other training sessions will be held later in the year (see box). Even before a storm makes land, Disaster Recovery is gathering information from local churches and district disaster coordinators in the area and staying in touch with emergency management and other responding agencies that will provide services after a disaster. Ministry team members are also evaluating opportunities for ministry so that at the appropriate time local churches can arrive and minister to those in need. The opportunities for ministries after a storm are limitless. Disaster Recovery Ministry Manager Pam Garrison said the ministry represents God’s compassion, love and mercy to a lost and hurting world. Garrison told the attendees that the most important things when preparing for a disaster are process, partnership and planning. “We are part of a big emergency management process. We don’t serve alone or in a vacuum, there is a process we plug into,” she said. Basic Disaster Ministry Training will be held again on Sept. 24 at South Shore United Methodist Church in Riverview. Spiritual Response Team Training will be held June 24 and 25 at the Life Enrichment Center in Fruitland Park. Early Response Team Training will be held Oct. 28 and 29 at the Warren W. Willis Camp. For more information, call 1-800-282-8011 extension 148. Disaster Response Ministry partners with other agencies providing services following a disaster to get resources where they are needed most. 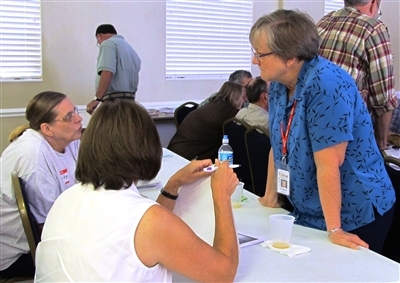 The primary partners are the United Methodist Committee on Relief (UMCOR) and United Methodist Volunteers in Mission (UMVIM) but also include governmental agencies such as Federal Emergency Management (FEMA), non-governmental organizations such as the American Red Cross and other faith-based organizations and groups in the private sector. While acknowledging that process and partnership are huge pieces of disaster recovery, Garrison couldn’t emphasize planning enough. Before relief can be administered following a disaster, there are other stages that must come first, Garrison explained – anticipation and warning, impact, aftermath and assessment, relief and remedy, short-term recovery and finally long-term recovery and reconstruction. When people are hurting, the natural response is to help, but Garrison cautioned trainees to be cautious and prayerful and not operate on emotion. Local churches can’t go into a disaster area on their own even with the best intentions, Garrison said. Garrison spent some time asking those in attendance to gather in small groups and talk about how their individual churches are already ministering in their communities. As people began to respond, a running list of various ministries was displayed around the room. While a local church may need to create a disaster recovery plan, it may find a unique way to serve in the days following a storm. Garrison mentioned one local church that provided a towel ministry of washing towels so storm survivors could have clean towels when utility services may be disrupted. Another ministry that local church members could implement may be as simple as members opening their homes so that storm survivors could take a hot shower. “Think about ministries that your church already has that could be useful during a disaster,” Garrison said. Once a local church has decided on a specific service to use to minister to the community, it is vital that a representative of the ministry stay in contact with the Conference Disaster Recover Ministry because of the overall process. During a break Jodie Whitney said learning about the different stages of a disaster, as well as how Disaster Recovery Ministry operates had been eye-opening. Richard and Nancy Be were also inspired. The members of Ridge Manor Community United Methodist Church said they would return home and revive their church’s disaster ministry plan. They have the background for it – Richard is a retired deputy sheriff and Nancy is a retired dispatcher for Pinellas County 911. “We are very excited about this ministry and hope to do more with it,” Nancy Be said.